Liverpool head to the Emirates Stadium on Saturday to face an in-form Arsenal side in the Premier League. The Reds will likely need to take all three points back to Anfield in order to keep pace with the holders and current title favourites Manchester City. Jurgen Klopp’s side face no easy task in taking on the Gunners though, who have been resurgent under the charge of new boss Unai Emery and are currently enjoying a thirteen-game unbeaten streak in all competitions. The north London outfit’s home record is also particularly impressive. Liverpool’s job gets even bigger when the appointment of Andre Marriner is taken into account. The referee will likely allow a free flowing game but his leniency with sides taking a more physical approach may well play into the hosts’ hands. 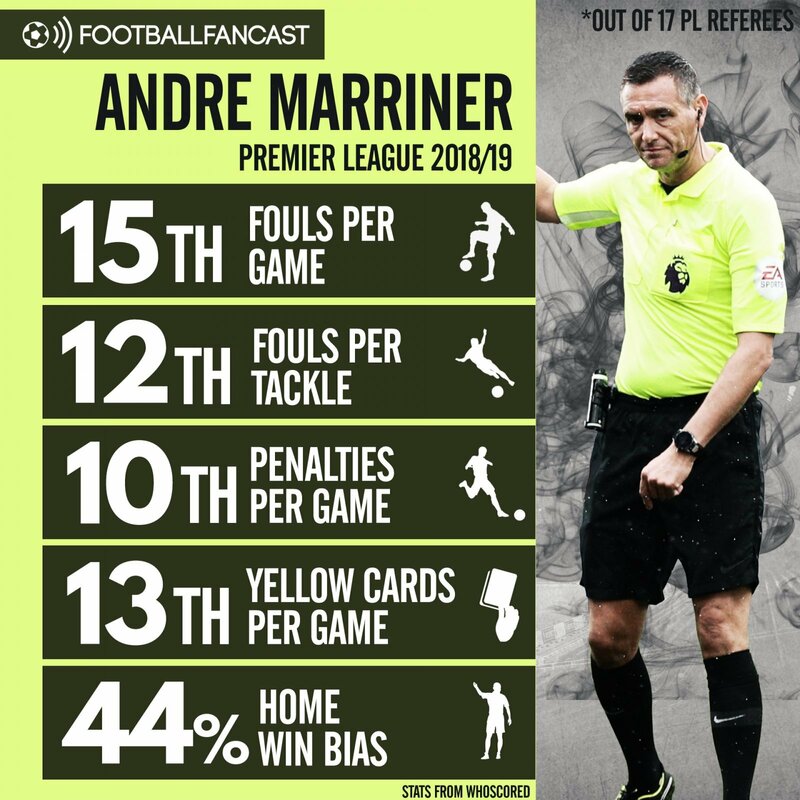 Out of 17 officials to have presided over a top flight match so far this season, Marriner ranks 15th in terms of fouls awarded per game, averaging just 19.22 a match. By contrast, Roger East has averaged 26 fouls per game so far. What’s more, the 47-year-old is not averse to letting robust challenges go. Marriner ranks 12th in terms of fouls per tackle, averaging 0.6 fouls per challenge. With Granit Xhaka and Lucas Torreira likely to be paired up together in midfield for the home side they ought to be relishing the opportunity to get stuck into their opponents in order to break their rhythm. With Emery’s side likely to employ an aggressive game plan, especially in order to snuff out any emerging counter-attacks quickly, they’ll also be encouraged by Marriner’s relative reluctance to show yellow cards. His average of 2.89 yellow cards per match sees him rank 13th out of the 17, while Craig Pawson leads the way on 4.43 yellows per game. We aren’t particularly likely to see a penalty on Saturday either, with Marriner on average only awarding spot kicks 0.22 times per game this season – seeing him rank 10th out of the 17. We are, however, likely to see a free flowing, aggressive game that should prove to be a real Premier League spectacle. One final bit of good news for the Gunners is the fact that the home side have emerged victorious in 44% of the matches that Marriner has overseen so far this season, whilst the away side have only had three points to celebrate 33% of the time. All that being said, Arsenal will still have to be at their very best to secure a result against the Reds.